Born into a family of musicians and raised in North America’s noisiest city, Ben grew for 17 years inside this cacophonous cocoon until he was freed by a Coqui frog in Puerto Rico, whose metronomic peeps made Ben realize that his two passions, music and nature, were not separate entities. After graduating from Wesleyan University with a Bachelor’s degree in Earth and Environmental Science, he worked in radio, where he engineered live performances and hosted a show on soundscapes under the alias Dr. Distortoise, and for a Hunter College neuroscience lab studying the evolutionary effect of ambient soundscapes on Madagascar Cichlids. 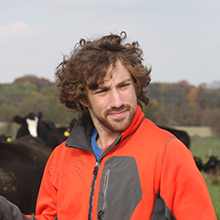 Now, as a doctoral student at Purdue, Ben is continuing his musical exploration of soundscapes through composition and field recording, and scientifically, through developing tools to analyze acoustic data and applying the principles of soundscape ecology to assist in biological conservation efforts. I am here to learn about and help protect all of Earth’s beautiful (non-human) creatures and the places they live. The best way I can do that is by pursuing my passions for nature sounds, soundscape ecology, and song writing, and from this platform make a difference. For someone who has trouble sitting still, I get surprisingly statue-like when I am alone, listening, in the woods.